I was trying to find a tasty side dish and I found this recipe on the All Recipes website. This dish had a lot of great reviews so I couldn't wait to try it. I am so happy I did because it was so delicious! Whenever I make this dish, many people request the recipe. It is so easy to make and doesn't take a lot of time. It definitely has an asian flair and kind of reminds me of a dish served at PF Changs (known Chinese Bistro chain). Bon appetit! Place the broccoli into a large pot with about 1 inch of water in the bottom. Bring to a boil, and cook for 7 minutes, or until tender but still crisp. Drain, and set aside. Melt the butter in a small skillet or wok over medium heat. Mix in the brown sugar, soy sauce, vinegar, pepper and garlic. Bring to a boil. Add cornstarch and stir until sauce has thickened. Turn off the heat. 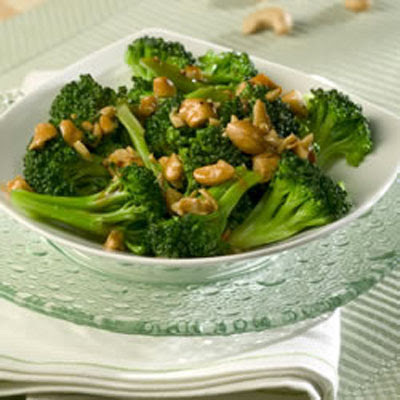 Mix in the cashews and broccoli. Serve immediately.